What do you all think Climate Change may do, is doing currently, and has done in the past concerning Tropical Activity, and do you think Climate Change is a threat in the future and will cause a greater number of and more violent storms or isn't to be worried about? I'd like to hear this forum's collective thoughts about this. Just to postulate, global warming increases the surface area of water across the planet. The slope of the shore line is maybe 1 to 12 [flat]. Then as the surface area of water increases there is more faster evaporation of that extra water. This in turn leads to more water vapor. More water vapor everywhere, but more water vapor in the tropics is more opportunity for storm creation as opposed to a dry tropical environment that limits development. In my opinion the anthropomorphic tilt of much of the global warming "science" is misanthropic. If the universe does something consistently over a period that exceeds human existence the chance that the root cause is something other than humanity exists. That is not to say that humanity doesn't amplify the issue, but still correlation is not proof of causality. I read how GW means that Europe is gonna start getting hit by bona fide tropical cyclones by the end of this century, due to the Atlantic waters warming. In 2005, Vince became the first tropical depression to hit Spain while still tropical. We’ve already almost seen that several times in recent years, including Grace in 09, Ophelia in 17, and Leslie in 18. Hurricanehink wrote: I read how GW means that Europe is gonna start getting hit by bona fide tropical cyclones by the end of this century, due to the Atlantic waters warming. In 2005, Vince became the first tropical depression to hit Spain while still tropical. We’ve already almost seen that several times in recent years, including Grace in 09, Ophelia in 17, and Leslie in 18. I think this unlikely (with the exception of near insignificant weakening events and extra-tropical transitioning storms). The mid-latitude jet stream will still exist which alone will rip tropical cyclones apart before they reach the shores of Europe, plus the sea surface temperatures will never warm enough to maintain a tropical cyclone. My view is that a warming climate may not lead to an increase in the numbers of tropical cyclones, if anything, model simulations suggest TC numbers will go down, but there may be a shift towards more of the top end storms like Haiyan and Patricia. It is as much about how the atmosphere evolves as the sea surface temperature trend. In a warmer climate, major hurricanes will still require favourable atmospheric conditions to form and strengthen, but a warmer sea surface temperature will result in a higher maximum potential intensity, which may allow greater strengthening of storms which form within optimal atmospheric conditions. Another likely effect is an increase in rainfall, a warmer atmosphere means a higher water vapour content at saturation, which I expect would lead to more of that water vapour raining out. A final possibility is an increase in blocking, which would increase the frequency of very slow moving or stalled tropical cyclones, like Harvey and Florence, which can dump huge rainfall totals on land with bad impacts for populated areas affected. https://www.wunderground.com/blog/JeffMasters/europe-expected-to-see-a-large-increase-in-hurricane-sandylike-hybrid.html - this is what I read from Dr. Jeff Masters. I was mistaken, Dr. Masters speculated that more hybrid like storms will hit Europe, but they won’t necessarily be tropical. More likely, more storms like Ophelia and Leslie. Sorry for my ignorance, but do you believe this will happen among all basins? Everyone agrees that rainfall from tropical cyclones will increase substantially - Harvey and Florence may be storms of the future in that sense, though of course still extreme outliers. To first order, this is just due to increased average water vapor concentration, though getting an exact number requires understanding feedbacks properly. Climate feedbacks from increasingly intense tropical cyclones are somewhat unclear. One of the great challenges in understanding the size of the global warming effect is the response of tropical convection to increased temperatures, and the resulting feedbacks, for example albedo and radiative capture due to cloud cover. Tropical cyclones themselves transport energy at a sufficiently large order of magnitude that they are important for the climate system, for reasons of cloud cover, interaction with tropical convection, and direct cooling of the ocean. Nobody knows how global warming will affect the total number of tropical systems (people have ideas, which I know less about, but Kerry didn't endorse any of them in particular). In fact, the question of how many tropical cyclones ought to form, on average, given the conditions of our current climate system is still quite mysterious, and it may be relatively insensitive to small-ish climatic perturbations. I get the feeling that many professionals expect the null hypothesis: that climate change will be a second-order effect on the total number of TCs (though this, too, is far from clear). Some modeling suggests that TCs (especially in the dry limit - yes, TCs can exist without water, using purely sensible heating!) can be close-packed in pure ocean systems, but they are clearly not close-packed on earth. Furthermore, you can run simulations of TCs with and without the westward propagating train of tropical waves typically seen in the ICTZ, and in fact the same number of TCs will form (in different places, of course) if you totally block the wave train. Shocking, right?! 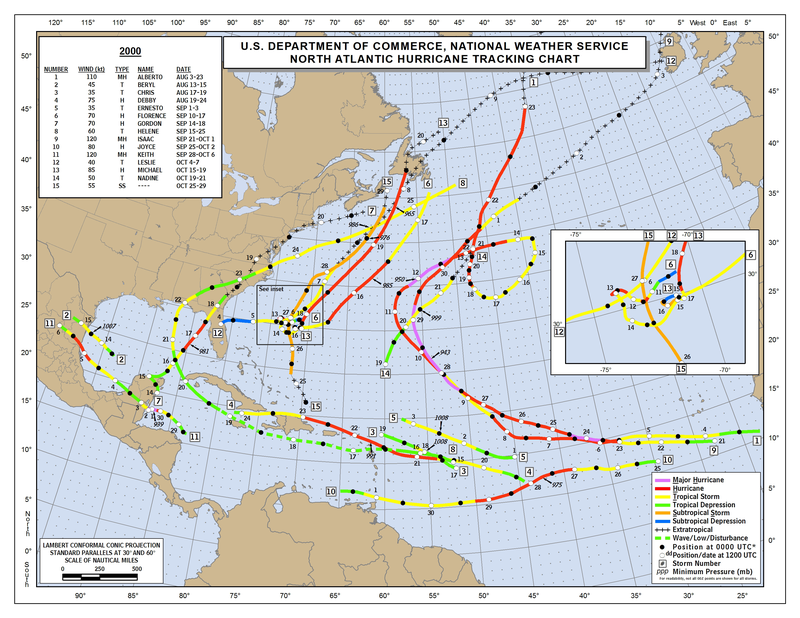 2000 is my analog year for the 2019 Atlantic Hurricane Season. The above hyperlink shows that in 2000 there were a couple of storm that blew in to Europe. There is a cool patch around the the Gulf of St Laurence, but the warming of the Labrador Current has to be pushing the North Atlantic Current south below that. So yeah I think that you may be looking at storms moving in a direction south of the these analog tracks. I don't know enough about the projections to say anything about basin-specific future outcomes. It is going to depend on how atmospheric conditions respond in a warming climate. If the atmosphere becomes more hostile on average to tropical cyclone formation whilst sea surface temperatures are rising, it may be that number stagnate or decrease. I do believe that whatever happens with the atmospheric circulation, by probability alone, there will be cases where atmospheric conditions are favourable for a strong hurricane in the vicinity of a developing tropical disturbance, and in such a scenario, a warmer SST will likely increase the chance of it developing into a major hurricane/typhoon/cyclone. I think this will happen in every basin, but I can't say on average if the most intense storms will increase in frequency or not in a specific basin, only that I expect globally they will increase. al78 wrote: I don't know enough about the projections to say anything about basin-specific future outcomes. It is going to depend on how atmospheric conditions respond in a warming climate. If the atmosphere becomes more hostile on average to tropical cyclone formation whilst sea surface temperatures are rising, it may be that number stagnate or decrease. I do believe that whatever happens with the atmospheric circulation, by probability alone, there will be cases where atmospheric conditions are favourable for a strong hurricane in the vicinity of a developing tropical disturbance, and in such a scenario, a warmer SST will likely increase the chance of it developing into a major hurricane/typhoon/cyclone. I think this will happen in every basin, but I can't say on average if the most intense storms will increase in frequency or not in a specific basin, only that I expect globally they will increase. Interesting read. A major flaw with these studies is the timeframe of the base model, not from my mechanism based hypothesis, but from the data gathering technology. The model base in these studies is 1981 to 2005. Starting in 2005 the sensitivity of the software change dramatically, and since then the new hardware is has also made bounding innovations making it easier to better determine the activity at the development layers of the atmosphere from satellites. Before 2005 satellite imagery was better than a fax, but the resolution could not separate cloud layers. From my point of view the aerosol assumptions don't take into account the effects of that sunspot cycle (Solar Cycle 23). The Solar Cycle during the model years was 120% stronger than the next solar cycle. A very strong solar cycle can increase global atmospheric pressure limiting hurricane development especially during northern hemisphere summers. Today we are between Solar Cycles so unusual heating of the Thermosphere is minimal. The nature of a hurricane is to take heat and turn it into a swirl, and combined with aerosols and intensify maximum allowable size dependent on the heat aerosol ratio. My opinion is that one should always expect the worst hurricane season if you live near the coast, and be happy if your roof doesn't get blown off. Interesting read. A major flaw with these studies is the timeframe of the base model, not from my mechanism based hypothesis, but from the data gathering technology. The model base in these studies is 1981 to 2005. Starting in 2005 the sensitivity of the software change dramatically, and since then the new hardware has also made bounding innovations making it easier to better determine the activity at the development layers of the atmosphere from satellites. Before 2005 satellite imagery was better than a fax, but the resolution could not separate cloud layers. From my point of view the aerosol assumptions don't take into account the effects of that sunspot cycle (Solar Cycle 23). The Solar Cycle during the model years was 120% stronger than the next solar cycle (Solar Max of 180 vs 80). A very strong solar cycle can increase global atmospheric pressure limiting hurricane development especially during northern hemisphere summers. Today we are between Solar Cycles so unusual heating of the Thermosphere is minimal.